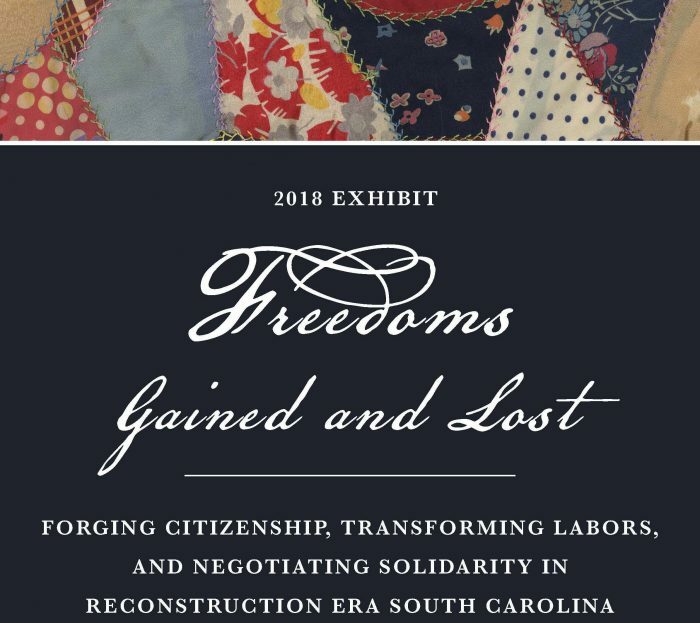 An original exhibit hosted by the College of Charleston Libraries, Freedoms Gained and Lost: Forging Citizenship, Transforming Labors, and Negotiating Solidarity in Reconstruction Era South Carolina was curated by archivists Mary Jo Fairchild and Aaisha Haykal. The exhibit showcases the documentary heritage of Reconstruction and the post-emancipation era in South Carolina and the Atlantic world and is informed by cultural heritage objects from repositories across the region. Freedoms Gained and Lost offers the public an opportunity to engage with sources that inform the (re)interpretation of the freedoms gained and lost by African descended peoples during Reconstruction era(s) in the United States. This digital exhibit is based on the larger gallery installation that will be open to the public through December 2018. The exhibit can be viewed online or on the third floor of the Addlestone Library, located at 205 Calhoun Street in Charleston, South Carolina. The curators would like to thank colleagues at the College of Charleston Libraries’ Avery Research Center for African American History and Culture, Special Collections, and the South Carolina Historical Society for support and assistance during the installation and design processes of this endeavor. In addition to these, generous cooperation and sharing of material culture and artifacts was given by the Charleston Museum, the Gibbes Museum of Art, and the South Carolina Department of Archives and History. Extensive thanks are also in order to everyone affiliated with the Carolina Lowcountry and Atlantic World Program for encouragement and collaboration.